I’m sitting at Boaters Landing Cafe today, Debbie and I have just had breakfast and now I’m working in the sun on my Tablet. 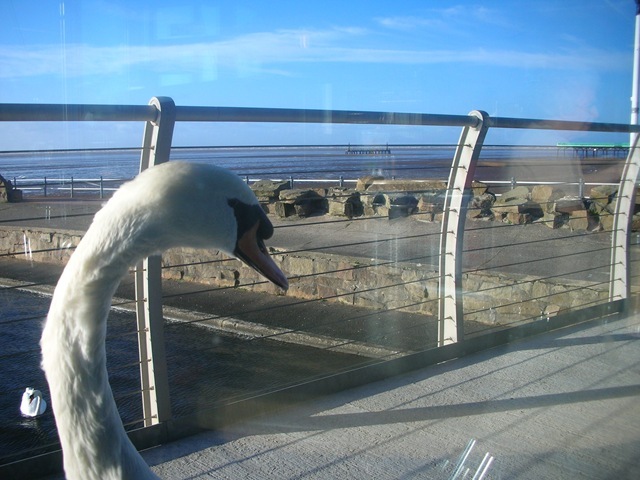 The view is great today with the sun shining on the wet beach and it’s even more interesting because our friendly Swans have decided to come and settle down next to me – on the other side of the window! A few minutes after this photo the swans curled up in the sun and kept me company for half an hour, until I had to leave for the Doctors. Click on the image to get it in all of it’s glory.